The Minneapolis restaurant scene is swiftly approaching embarrassment of riches territory and the object of my latest menu feasting is helping to tip that scale, one delicious bite at a time. Eastside is the newest creation of award­-winning restaurateur Ryan Burnet. You know him from such Minneapolis neo­classic dining wonders as Burch, Bar La Grassa, and Barrio. Together with executive chef Remy Pettus (late of Cosmos), the two have conspired to bring earnest, sincere dining to a growing neighborhood grateful for options. And options is exactly what Minneapolis’ Downtown East needs. Located at the corner of Third and Washington, Eastside is perfectly situated. And not just for its surrounding residents either, particularly those filling the luxury apartments above the restaurant in Latitude 45. My first gasp of delight upon entering the restaurant was the realization that it is walking distance to the Guthrie. Aesthetically, the restaurant has as much depth and complexity as its menu. Simply put, it’s gorgeous. An inspired mix of industrial, modern, and vaguely Craftsman. The tile floors alone will mesmerize you while you wait for your food. Speaking of food, shall we talk menu? Let’s. After all, that’s why you’re here, no? A couple weeks back on a crispy fall weekday afternoon, a couple friends and I had the chance to explore Eastside. Our late afternoon nosh started just as the happy hour crowd began to bubble in. First to the table was the tuna poke. There’s no better way, in my opinion, to start a meal. Fresh buttery tuna and rich avocado dance around in your mouth with a hint of tart and fire brought by grapefruit and Fresno peppers. If your taste buds were asleep after a boring bag lunch, welcome back to flavor in 3D. On to the wood-roasted carrot salad and a chance to taste actual fall. Yes, the season. 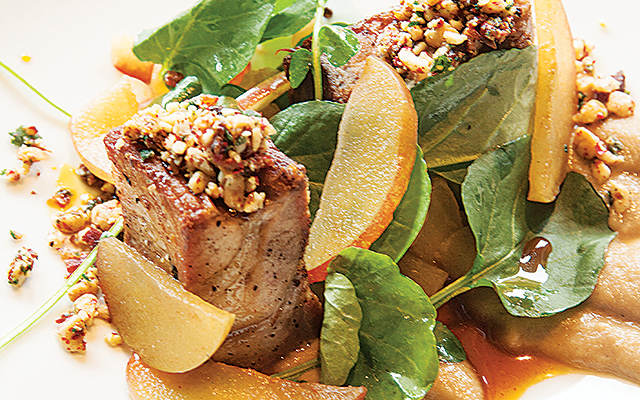 Chef Remy isn’t just adamant about his menu reflecting the neighborhood, but also the change of seasons. 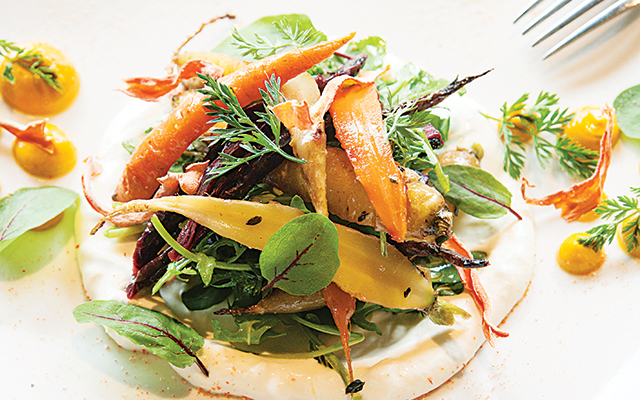 The roasted carrot salad pays homage to this philosophy and deliciously so. Nothing says autumn like the sweet bite of roasted root vegetables. Next up, calamari. Whenever I see it on a menu, I order it. I’m not quite sure why. Typically, I’m underwhelmed. Eastside is not typical and underwhelming doesn’t seem to be in their vocabulary. It’s prepared à la plancha, tenderly grilled to release all its sea­faring flavor. A welcome change from the typically over­fried rubber bands that wind up on my plate. The pistachios were also a delightful surprise. The main event at this meal was the Snake River flat iron steak. 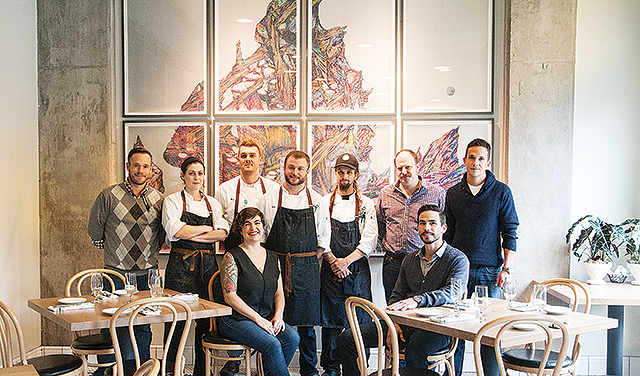 Eastside isn’t a steakhouse, but you know the guy behind Burch isn’t going to let you down. And he doesn’t. Frankly, this steak rivals anything you’d get at Burch. Or any place in town. It’s that good. It’s paired with scalloped potatoes that you’ll wish came in a double order. And an order to go. Along with the steak, I highly recommend you get an order of Chef Remy’s fried wild rice. It’s comfort food at its best. And most Minnesotan. Which makes it just that much more comforting. Don’t miss the pork shoulder with curry caramel sauce. You heard me: curry caramel sauce. Speaking of comfort, I’d be remiss if I skipped dessert. Although, I did. At some point this month, I thought a 30-day no-sugar challenge sounded like a great idea. Luckily for you, my dinner companions weren’t on the same self-­imposed restriction. 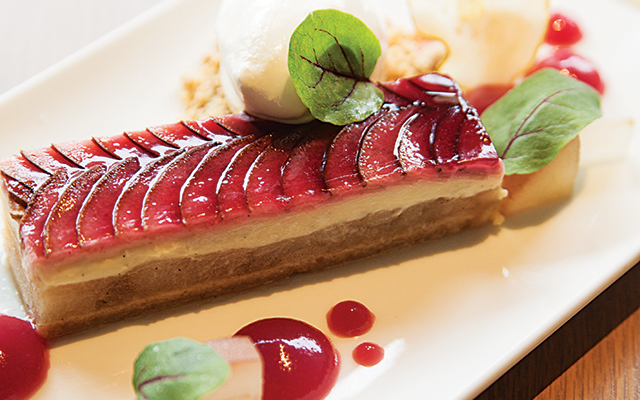 And they couldn’t stop talking about the pear tart with its lavender-­infused white chocolate pastry cream. Seriously, I’m going back post-­challenge for the pear tart. And the maple pecan pie. For the cocktail­-inclined, you’ll be happy to know local distiller Dan Oskey of Tattersall helped craft a beverage menu as playful as the food. Sherry cocktails are a signature highlight, designed to pair perfectly with your meal. Also unique to Eastside, the cider pours are as fun as they are fantastic. If you’ve read this far, you’re already planning your first trip to Eastside. Truly, you’ll be glad you did. I’ll be back. There’s a fried chicken sandwich on a pretzel bun that’s been calling my name ever since I saw it on the menu. It is neither cliché nor hyperbole to say Eastside has it all. It really does. Great location with a wonderfully inviting, thoughtful menu and a staff clearly passionate about offering guests a memorable meal.